CHROs, like other CxOs, recognize that the barriers between previously separate industries are collapsing, as companies in one sector apply their expertise to others. For example, electric carmaker Tesla is entering the power sector with a new line of zero-carbon batteries for homes, businesses and utilities. In 2014 Carnegie Mellon had some of the world’s brightest robotics minds working on its campus. These people were focused on the bleeding edge of robotics technology and their research could have created new breakthroughs and advancements in the use of robotic technology for the betterment of mankind. But then they left. All of them. In a surprise move, Uber lured the scientists away and brought them into the fold. This not only caused a blow to the university—it also affected each of us. The research that was performed at Carnegie Mellon would have certainly been published in academic journals and shared with the world, forming the basis for new breakthroughs in robotics and other fields. The research they complete at Uber? It’s going to be tucked away in a proprietary database for the benefit of the company’s pursuit of a robotic car fleet. This type of activity is incredibly disruptive, and that can lead to chaos for the business world. Disruption by its very nature is incredibly challenging to predict. Who knows which technologies will boom and which will bust? In addition, every good HR leader knows that being aware of external factors is the key to a proper HR strategy. In the past, this has meant examining the landscape and understanding how your competition stacks up. But now that competition can come from virtually any industry, region, or company. Here’s a familiar story: Blockbuster thought it was too big to fail. Netflix actually approached Blockbuster about co-promoting its streaming service in store, and the company’s leaders were quickly turned down. Today? Netflix is doing better than ever, and my six-year old children have never even heard of Blockbuster. I have been having quite a bit of fun lately. I’m working on a project now that examines the extent to which the work that the talent acquisition function does can be automated. What if everything that occurs after the recruiter pushes the button to approve a job was fully automatic with no human interaction? The end result would be a job offer and onboarding portal handling the new hire to bring them into the organization. It sounds crazy, but it’s not as far off as you might imagine. While no system does all of these things, there are several providers (and corporations) that have developed pieces of the system to drive this vision. For instance, Amazon has a tool that will automatically generate job offers to candidates that meet minimum criteria for some positions. This was developed after the organization realized there was no performance difference between those that interviewed and those that did not. You may be skeptical. Research shows us that when asked if jobs will be automated, people overwhelmingly agree. The interesting counterpoint is that those same people almost always say that their jobs will not be the ones automated. While this and the disruption piece above seem disconnected, they are tightly interwoven. Being able to scan the market for competition and build a true map of the competitive landscape is (for now) something that needs a human touch. And there are absolutely other pieces of this profession that require more than an algorithm for processing. 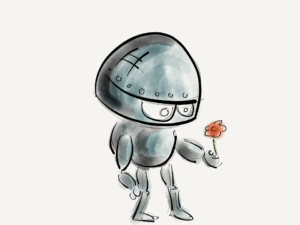 The question I always ask myself is this: if my job was automated, what could I do to add value? This was on the forefront of my mind years ago when I worked in HR and first started hearing discussions around robots in the workplace. Even then I started thinking about how to get away from highly manual processes and spend more time focusing on creating an environment with rich experiences for employees. While the automated still not a reality, we’re seeing small, consistent steps in that direction. Take 3D printing for example. While it’s not completely replacing the work that people can do, it’s certainly shifting it around. For example, what about the people that printed the materials and then assembled a set of houses? Or maybe it’s the self-driving cars Uber has launched in Pittsburgh. Think about it. While our work is more thought than manual, there’s still opportunity for innovation. With the bots, artificial intelligence, and machine learning all coming to the forefront of talent and learning technology, what can you do to ensure greater performance than the computers can achieve alone? Will people look back on HR and recruiting as the organizational equivalents of Fortran coding, or will there be ways to work alongside the technology to create a better, brighter future?